I've been asked this question quite a few times and keep putting it off. Yep, I've been dodging it entirely... until now. I have only used math notebooks in my classroom for a year, so it's very possible that my opinion will change, but so far I haven't seen the need to grade them. My students loved them and they were an integral part of our classroom almost daily last year. I never once took a "notebook grade." I had the expectation that my students keep up with them, and honestly, they loved using them so much that they enjoyed keeping them up to date. Here are a few ways I quickly checked progress without assigning any point-value grades. (1) Visual checks as students work. Most of what is in our notebooks took place during class time. I would give students time to complete the activities or set-up pages and walk around to monitor/assist. Students knew we weren't moving on to anything else until all members of our learning team (that's what I call a class) had accomplished the task. They usually stayed on task and worked quickly but thoroughly. (2) I collected and graded individual assignments from time to time. If there was something specific assigned, I would walk around the room and look at each students' notebook very quickly while they completed a warm up or other independent activity. I carry my grade book with me and usually check mark students who are done correctly and make quick notes about students who need to fix specific things. I mention these things to students and they show me their notebook at a later time after the error has been fixed. Sometimes students completed small review activities and turned in their notebooks on test day. While they took their tests I quickly checked their assignments. 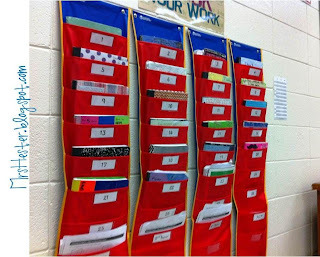 The red hanging system is how students turn in their homework daily, by number order so it's already alphabetized for me. :) It's the little things, right? Anyway... Since they are used to that system they just stick their notebook in their file on test day, I pull it out and grade the assignment (usually a review completion grade), and then put it right back in their numbered pocket. By the time they are done testing, their notebooks are graded. They pick up their notebooks from their pockets before leaving the classroom. (3) Sometimes I let students use their notebooks on quizzes. This is usually an unannounced thing and they pick up on it very quickly after the first time. They keep their notebooks in order hoping that I'll say "notebooks out!" during the next quiz. Sometimes I do, sometimes I don't. So Why Did I Hide It? I dunno... I guess I felt kind of guilty. That "everyone else seems to be taking a grade, am I doing this wrong?!" feeling, ya know? But the conclusion I've come to... it works for me! And whatever you decide to do has to work for you. It's your classroom and your students. You're the one that will be living it daily and you have to choose a system that fits you. Don't feel pressured to comply with what everyone else is doing just because they're doing it. Dare to be different, right?! That's what we tell our kiddos! I have read a few ideas online and seen some pins that I might implement. I plan to keep most of what I mentioned above the same, it worked well for me, I just might add some little things to the mix. (1) Choose between one and four students each day to look through their notebooks for completion and neatness. This will be for a small grade each time, maybe once per unit. I might try to integrate this into a warm-up rotation schedule I've been pondering. More to come on that later! (2) Ask students to leave their notebooks in the classroom over a designated night (when they don't need them to complete a homework assignment). Grade about 5 notebooks, chosen at random, and record the grades. Students will be informed the next class period whose notebooks were graded. (3) Have students take a quiz using another student's notebook. They will then care what their classmates are putting into their notebooks. Kiddos telling other kiddos to keep their notebooks up to date - golden! What would not be so golden is a great student having to use a sub par notebook on a quiz when their notebook is A+ work. Hmmmmm... Not 100% sold on this one yet. If you choose to collect and grade notebooks, go for it! Just do it because you see value in it and it's a worthwhile endeavor in your classroom, not because you feel like you have to. 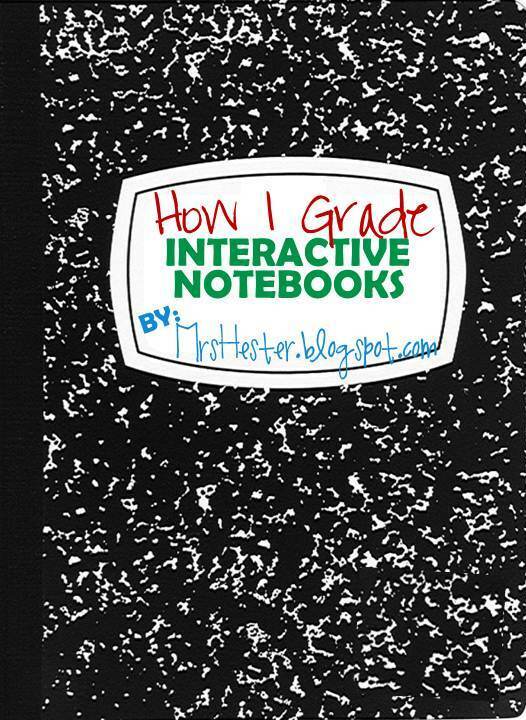 So there it is... my method for grading, or not grading rather, interactive notebooks. Thanks for sharing your ideas on this! I'm starting INBs in the fall with my classes and I didn't consider grading them until I read about all the people who do grade them! I still think I will, mainly because I anticipate some of our left sides will be completed outside of class. Before I grade notebooks the first time, I'm going to have the students self-assess with the rubric, then have a peer evaluate them. Then they can make any necessary changes before I grade them. I also plan to give at least one quiz per term using the notebook, but we won't be trading notebooks for this purpose. No problem, I hope some piece was helpful! Good luck this year, I hope you love INBs as much as I do. Thanks for this. I struggled with the grading process of these last year so bad! IT might help that we are a Standards Based Grading school, and quite frankly ISN's are formative not summative. HOWEVER. I like your pockets for quick checks, and your random grade. I thought about doing a random grade thing last year (of course I could not just start implementing it). The idea would be I would draw 5 names from a bucket per week. Students will not know who they are, but the whole class would get a grade for ISN's that week based on the mean grade for those 5 notebooks. This could foster trust, community, and high expectations. But it could also be a disaster! I just know grading every single one every week was a nightmare! I think if I only had 30 students it would be fine, but the fact that I had 6 classes of 30+ made my life miserable when it came to grading. I cannot imagine grading all of them, I have similar numbers to you. I graded their glossary assignments individually and thoroughly and thought I was going to die! Ha! Good luck tweaking your system! I LOVE using INB's and have been using them for six years. I do take a grade for mine at least twice per quarter. I create a scavenger hunt, usually one question per page of the INB, students trade with a neighbor and peer grade. Whallah! I use the grade as a summarize grade. Most kids do very well, and those who do not, have the opportunity to "redo" what is missing or incorrect. Hi Jessie Hester, I'm Karen Hester (and I seriously wanted to name my daughter Jessie)! I saw your blog title and had to follow you, since I also hear "I'm in Mrs. Hester's class!" all the time (even though it's second grade). Enjoy the rest of your summer. You should link this up to 4mulafun.com and her linky about ISN's. I want to link up but I can't due to the fact that I do not have anything to blog about yet! Ha! That was a funny post. For so many years, I didn't grade my students' interactive notebooks, but I found a super-easy way to do it this past year. It really is more of an organizational grade (to make sure they are keeping up with it and have the right information on the right pages). I keep a master interactive notebook. During the last week of each grading cycle, I create 10 questions that require my students to use their notebook in order to answer (and it's a timed quiz...they only get 10 minutes, which is more than enough time for 99% of them). Questions may be formatted like this: "On page 25, what is the formula we used to solve the problem behind the 2nd flap?" or "Use the foldable on page 30 to fill in the blanks. A force is a ______ or a ______." All students should have identical answers to all of the questions, for ease of grading. It's quick and easy. Great idea Shayna! I might have to try that sometimes!! I read something similar last summer on Jack Of All Trades blog (http://jackofalltrades-leslie.blogspot.com). Must work well if multiple teachers are implementing it! This is how I grade notebooks also! I give a notebook/binder test at the end of each quarter. There are 10 questions from the notebook and 10 questions from the binder. They must use their IMNs and binder to answer the questions such as "What is the answer to practice problem #2 on pg. 23?". It checks for organization of their notebooks and "should" be an easy A, as long as students did what they were supposed to in class. Great idea! In addition to allowing my students to use their Nb for quizzes, when I grade notebooks I choose one assn from the table of contents to check. Since we write the TOC together, and the NB is completed in class I check only one specific entry in their NB. If it is not on that page, completed correctly their score for the notebook is a 70%, if it is perfect its100%. I know this seems harsh, but this is a quick Ci, and the students quickly get the idea that any assn. could be the one graded! I thought I was a slacker because I didn't find the time to grade these wonderful notebooks. I love the idea Shayna A left. That sounds like something I can work with!! Love your ideas. I teach Science to 7th graders. I had 125 students last year, so was totally freaked at the idea of using INBs. Luckily, our school bought the Science Fusion text/workbooks, so students did work in their book. I would do walk-around checks and collected workbooks to grade on test days. This year I will use them with my honors class only. I may do the "trade notebooks for quiz" grade idea -- my students usually work within groups, and this will encourage (I hope) the groups to stay on task. Only time will tell! What are the red things you're using for pockets and how or where can I get them? I've used file cabinets before.... May do that again but I like yours too! Love your idea about have students to exchange their notebooks for a quiz. I am introducing this year interactive notebook in my geometry classes. Using it as an incentive for quizzes is a great idea!! I grade my interactive notebooks by standard which works really well if you set up your grade book for standards based grading! Thanks for the great ideas! Last year was my first year teaching, and I used INBs. I had over 100 students, and it was so time consuming to grade them all every time we had a test. I don't think trading notebooks for a grade is fair, but I will definitely start grading them daily as students work on morning warm ups, and even try Shayna's quiz idea. Hello, I just wanted to share an idea I was given. You can do a notebook quiz. For example, it can be 10 questions like on 3/12/15, what was the topic of the lesson? Give the second example given on quadratic equations. Name the last three lessons. What date did we cover intercepts? It's a great way to not only check their notebooks but also their organization skills. I haven't tried it because I don't plan to implement it until next year so I'm doing some research. I've heard good things about it so hopefully you all find this helpful. I am glad to see other people using this system. My father used these composition books in his Biology classroom twenty years ago and I have been using it for around the last 5. Not only does it create student accountability but keeps everything in a neat and compact package. I teach foreign languages and my students' responses have been very popular. Many continue to use their books the subsequent years and into college. Kudos on your success! Keep it up! Two ideas of I have heard of put the grading on other students. This first idea is to have students trade notebooks with one another and they grade based on a rubric you have designed. The rubric could include topics like: Content, legibility, neatness, accuracy, etc. Students would then analyze other notebooks and see how theirs compares to others. There could also be a section for constructive criticism where they can give ideas on how to improve the notebook. Students would then return to the original owner and see how others viewed their notebook. You would then collect the rubrics and record the scores. The other idea I've seen is to send the notebooks home with the students and have their parents grade it based on a similar rubric. This would encourage students to talk to their parents about what they are learning and defend their work in their notebook. Parents would also stay informed on what's going in on class and they would have a chance to see the quality of work their kids are producing. The grade would come from the parent and would be returned by the student. You could record the parent's score. If the student does not return their rubric this would be a way to open communication with parents about why they are not getting it filled out or how papers are getting lost between home and school. I'm interested in trying this and turning the grading into more of a "self" reflection than a "teacher" reflection. Keep us updated on what you decide! 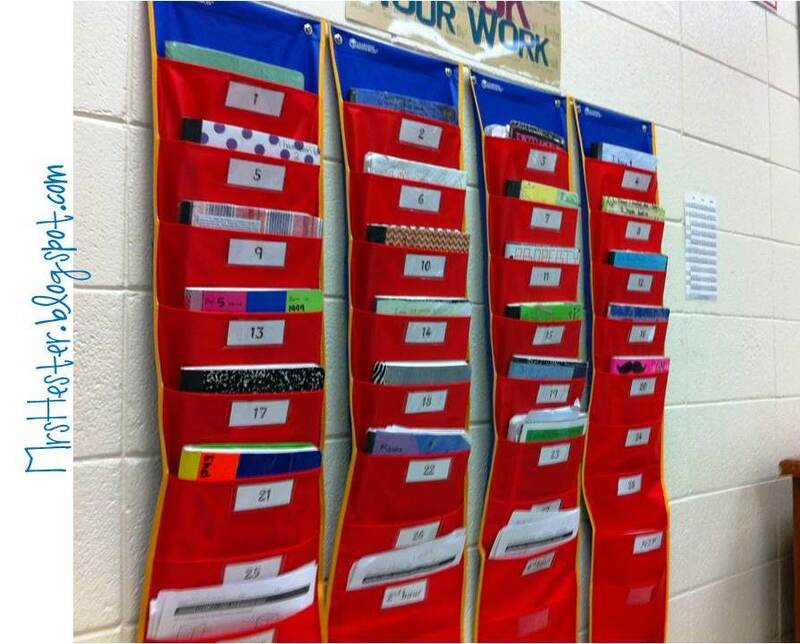 Do you have a hanging file and number for every student? I'm trying to imagine how I would do that in my classroom with limited wall space. I like the idea of already being alphabetized. In the school where I teach, we either have students keep their notebooks in their backpack or assign a shelf for each grading period. You can also add different colors of duct tape to the spine and assign each class period a color. Works great! You are a genius! I do some of this already. Now, I will fine tune. Thank you!! I grade my inb's on test day. I only grade the unit we're on and give a classwork grade for each unit. Honestly, I just count how many completed pages they have. I usually have the notebooks by the time the exam is over. I use a quick rubric on a sliding scale of a 0,1,3,5. I have given each student a sample with the grading rubric and what they need to earn each number. I have each student self assess and tell them I will check and grade them based on the same rubric (the Ss are usually harder on themselves) and give them the grade they have given themselves. I check 5-10 Ss (ones who may inflate/ deflate their work) but ultimately I give them what they gave themselves. This eliminates any complaining, because, one, they have had the rubric from day one, two, they gave them that grade.